Amazon to Hachette: let's be friends? Amazon and Hachette bury the, erm, dispute over ebooks. Get out your hankies and brace yourself for waterworks. Amazon and publishing giant Hachette have kissed and made up, ending their feud over the price of ebooks. Isn't is just wonderful when old friends reconcile? Well, old standoffish colleagues, anyway. Though the exact details of the deal haven't been announced, Amazon have conceded the right to price ebooks to Hachette, in a similar way as it did to Simon & Schuster a fortnight ago. Amazon had wanted to cap the price of ebooks, of which it sells the lion's share, at $9.99 (£6.36), while increasing its cut. Unsurprisingly, the publishing houses weren't happy with this and Hachette took a stand. Cue Amazon's 'negotiating tactics', which involved freezing pre-orders, delaying shipments by up to a month and reducing discounts on Hachette books. This may have hurt Hachette, but it prompted a serious publicity backlash. Over 1,000 authors, many of them at the publishing house, teamed up as the snazzily-titled Authors United to send letters to Amazon directors. They even took out a a full page ad in the New York Times. Despite thousands of, ahem, less well-known, self-published authors flocking to Amazon's defence, Authors United appears to have proved that the pen is indeed mightier than the devastatingly effective transnational logistical operation, for Amazon has relented. Its sanctions are lifted and normal trading has resumed. While this isn't exactly a David and Goliath story (Hachette is part of French media conglomerate Lagardere, which turned over £5.8bn last year), it does represent a victory for the relatively smaller giants. Amazon have effectively agreed that publishers should be able to manage the transition from print to ebook themselves. But it wasn't an entirely one-sided deal. Amazon have said Hachette will benefit from better terms if they keep ebook prices low, which will benefit Jeff Bezos' two favourite things, Amazon's top line and the Kindle. 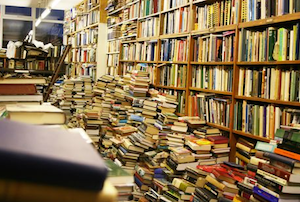 It may be a minor setback for Amazon, but in the long run the bookselling trends all run in its favour.